Posted at: 11/22/2010 08:23:00 PM . 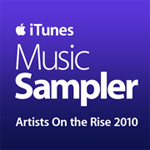 If you are a fan of iTunes on Facebook, you can currently get a promotional code for the new sampler. It has twenty new songs from unknown artists.